DUVE Berlin is pleased to present the first solo exhibition at the gallery by New York artist JEN DENIKE. 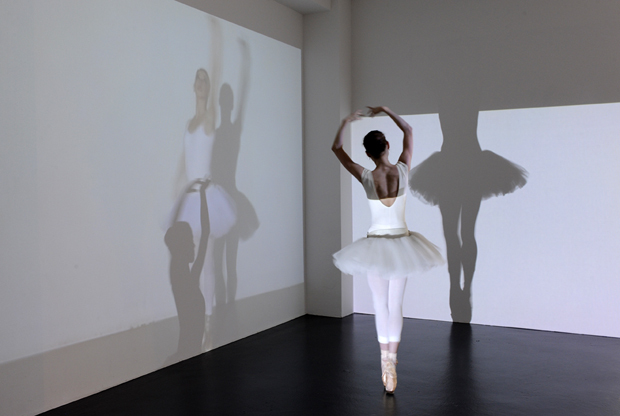 *The Scrying Trilogy* encompasses three new works from 2010: Another Circle, Crystal Forest and Hydromancy, incorporating ballet choreography, video, performance, and sculptural installation. 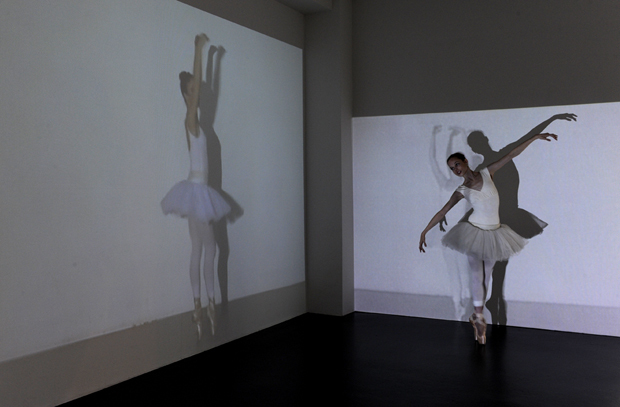 On the opening night, the artist will be showing two performances, each expanding on themes from her ballet *SCRYING*, which debuted earlier this year at the Museum of Modern Art in New York, and at the Julia Stoschek Collection in Düsseldorf. DeNike, in collaboration with choreographer Melissa Barak realized the non-narrative three-act ballet *SCRYING* in the George Balanchine tradition. The *SCRYING* ballet originally inspired by a text written by Damien Echols, was translated by DeNike during a ballet workshop with Barak and six dancers in Santa Monica during the summer of 2009. Balanchine advanced and transformed the scope of the classical ballet according to new body consciousness and expressive experience of the 20th century. 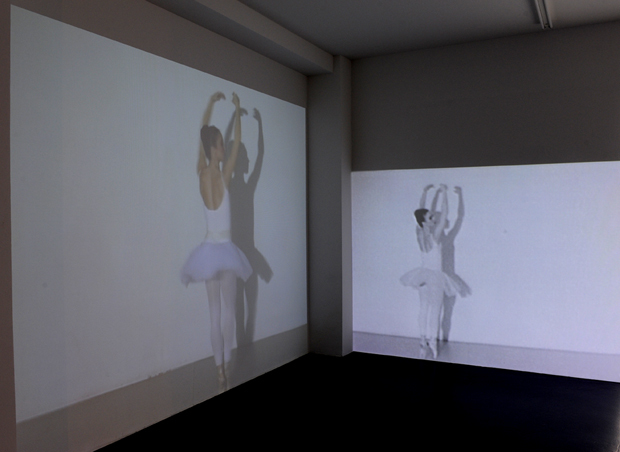 DeNike integrates classical ballet into contemporary art through the exploration and deconstruction of a formal vocabulary of ballet and abstract body movement, personal mythology, and ritual. Scrying is a practice of magic or divination that involves seeing visions through physical mediums such as water, mirrors, crystals, or reflective surfaces. The process is performed with the intent of deepening a trance state, used to gain insight into situations, or to see into the future or the past. 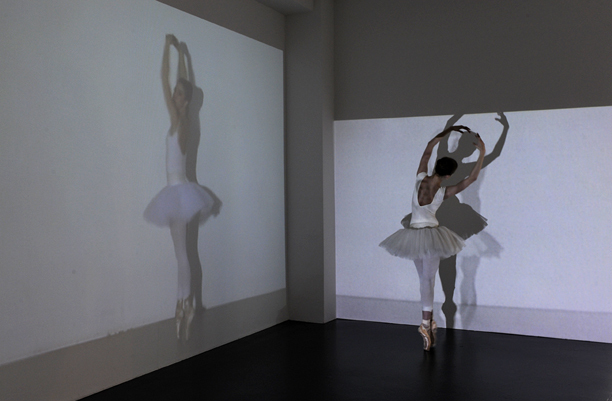 DeNike presents two separate projections of Another Circle; a single channel video projection, and a 16mm film, both depict a ballerina in classical tutu and toe shoes rotating in what appears to be an infinite pirouette, evoking the bodily repetition of scrying. 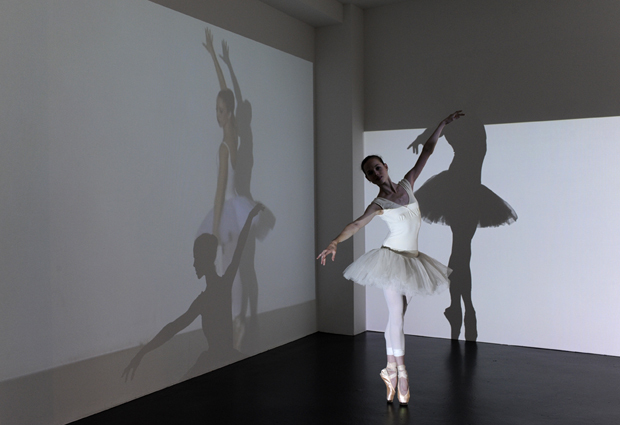 During the opening reception at DUVE Berlin, a ballerina will perform mirroring and reacting to the hypnotic action in the video. Coinciding with Another Circle, DeNike presents, *Hydromancy*which is part performance and part sculptural installation. 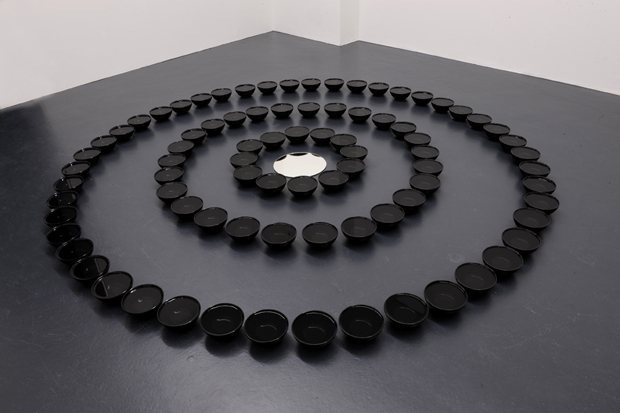 Rows of black bowls are filled with water and placed in three concentric circles, during the opening night a performer will slowly move gesturing between the bowls, seeking to conjure divination through the water. 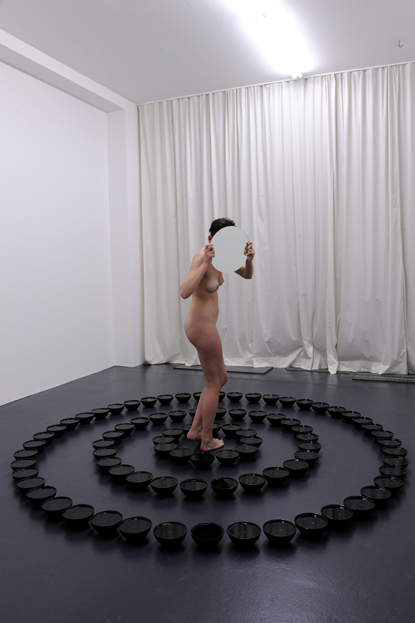 When the performer is absent, a circular mirror is placed in center of the bowls on the floor forming an additional circle. Hereafter the performance remains in the space as a residue of invisible presence. 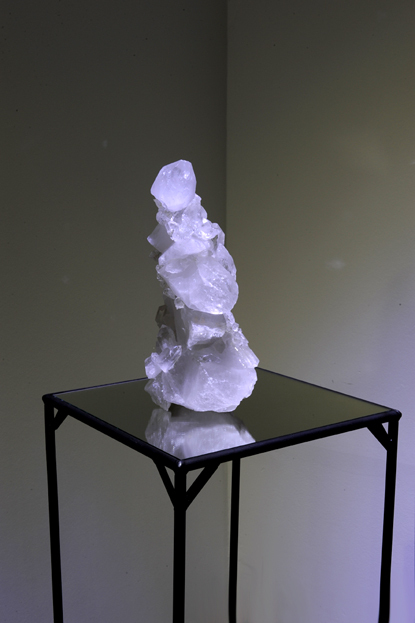 DeNike also presents Crystal Forest which consists of crystal sculptures, mined from the earth by the hands of the artist near Hot Springs, Arkansas in the summer of 2010. DeNike selected specific crystals ranging in size, and then infused each with 'magick' to be used as a conduit for scrying. 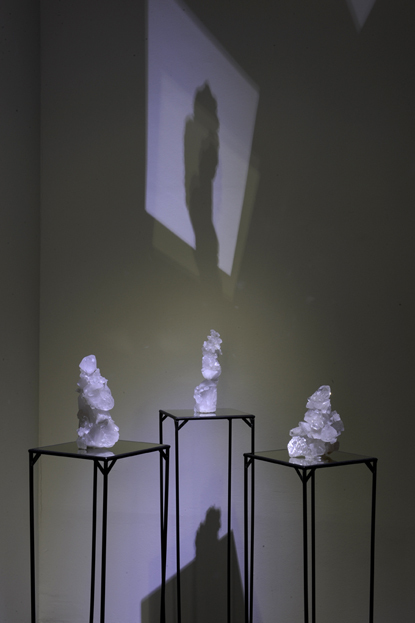 The crystals are then placed on custom-made mirrored steel pedestals as still-lifes. JEN DENIKE (*1971) lives and works in New York City. Her work has been exhibited internationally including exhibitions at MoMA NY, KW Institute for Contemporary Art Berlin, The Brooklyn Museum, Tensta Konsthall Stockholm, Julia Stoschek Collection, Claudia Groeflin Zurich, The Company LA, Smith-Stewart NY, PS1/MoMA, Contemporary Arts Museum Houston, and Deichtorhallen Hamburg. Her work is in the permanent collection of the Museum of Modern Art , Julia Stoschek Collection, and IL Giardino dei Lauri Collection. Jen received her MFA from Bard College in 2002.